Chris Evans at the premiere Of Marvel’s “Captain America: The Winter Soldier” at the El Capitan Theatre on March 13, 2014, in Hollywood, California. It’s January, which means the last few bits of Oscar bait are hitting theaters. But we still have a week or so until the nominations are announced, giving us a brief breather after the start of the new year to contemplate a crucial question: What on earth is going to happen in 2016 anyway? In the FiveThirtyEight culture section, we’re a little less prediction-prone than our colleagues in politics and sports. Still, there are lots of things that data can tell us about what may transpire in 2016 in the world of pop culture. Based on what we learned from some of the biggest stories of 2015, here are some well-caveated but reasonable bets about next year. 1. It’s gonna be super. If we ignore “The Peanuts Movie,” which had a distinctively different tenor than the other comic-based movies of 2015, that’s still $824 million at the box office, 7.4 percent. 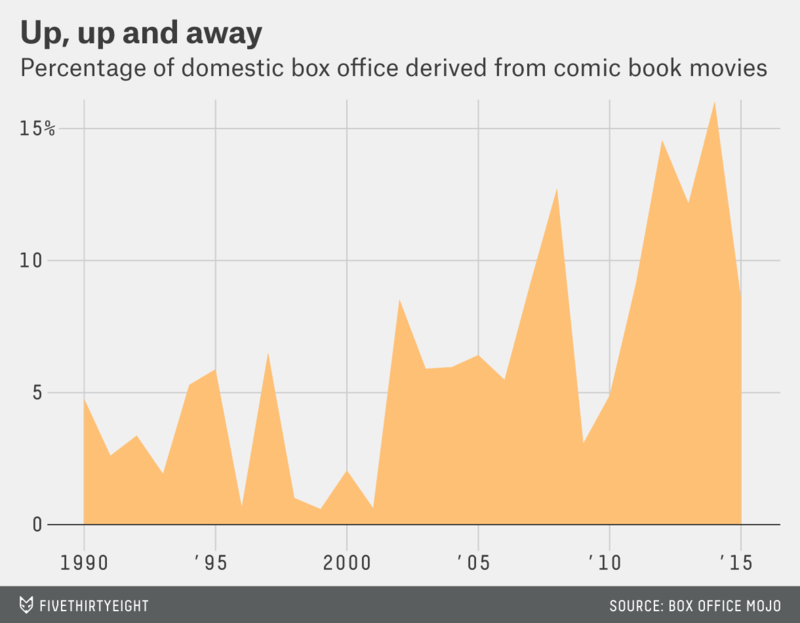 In the end, even in a year that was dominated by two films not based on comics — “Jurassic World” and “Star Wars: The Force Awakens” — one out of every $13 of gross revenue collected in the domestic film market came from movies based on comic books. People who make movies are not dumb and were presumably aware of the general curve in that chart a few years ago when they planned out 2016, a year that will be grotesquely super in nature. According to Box Office Mojo, there are eight superhero films on the schedule already: “Deadpool,” “Batman v Superman: Dawn of Justice,” “Captain America: Civil War,” “X-Men: Apocalypse,” “Teenage Mutant Ninja Turtles: Out of the Shadows,” “Suicide Squad,” “Gambit,” and “Doctor Strange.” This will finally be the year the colon wears out on my keyboard. Superheroes are gonna make a bajillion dollars. 2. The song of the summer might already be out. Last year took it to an extreme: Billboard’s analysis of summer songs found that “Cheerleader” by OMI was the song of the summer. The original version of the song was released way the hell back in 2012, but the version that popped last summer was a Felix Jaehn remix released in May 2014. That’s a full year before it debuted on the Billboard Top 100 and climbed a slow hike to the top of the charts, meandering through Europe and the U.K. until finally landing on U.S. shores. 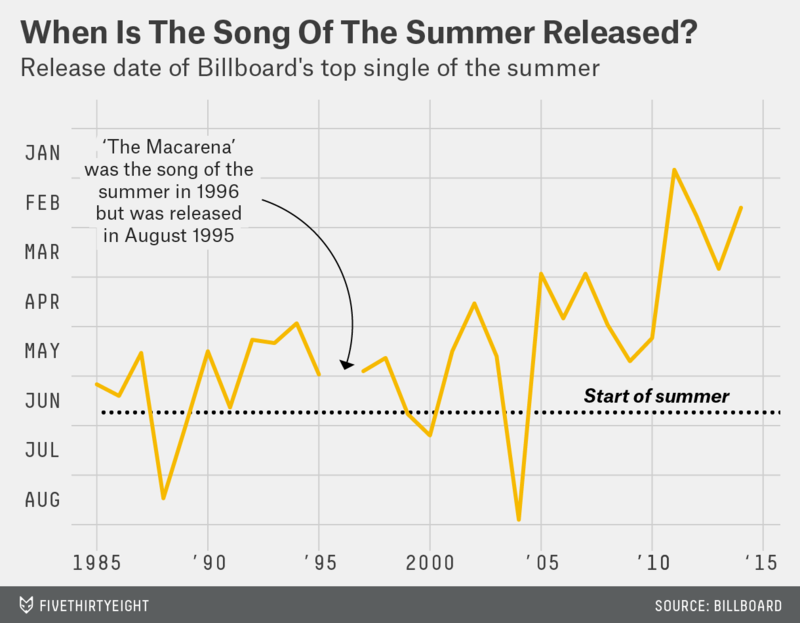 Even if last year was an extreme, it just proves the point that the top single of the summer hasn’t come out during the summer in the past 10 years — it has actually dropped in March or earlier in four of the past five years. 3. The movie industry may still refuse to cast women. Each year in the late summer, the Media, Diversity, and Social Change Initiative at the University of Southern California’s Annenberg School for Communication and Journalism releases a report detailing how diverse the previous year’s top 100-performing films at the box office were. 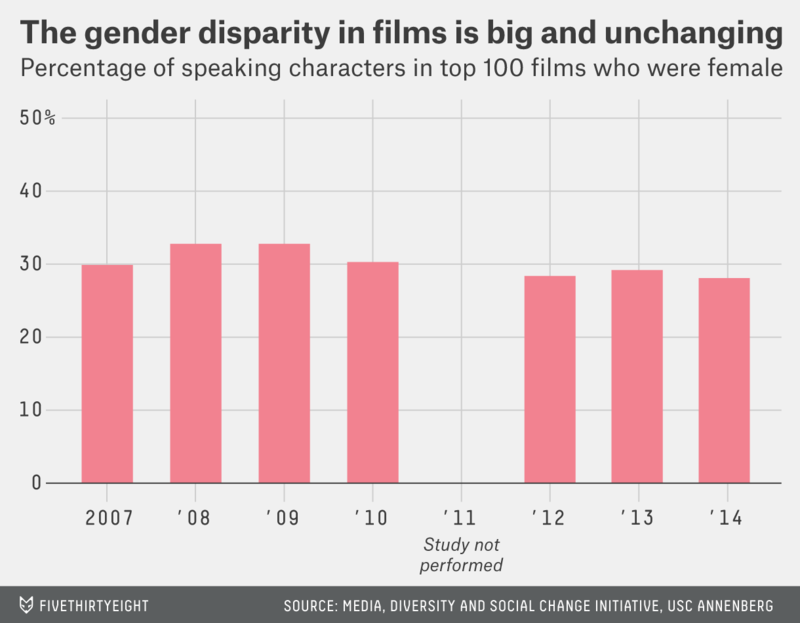 The research group laboriously codes detailed data on every speaking character in each of the 100 movies. And based on the most recent data published by the initiative, there’s no reason to expect Hollywood to be better this year than in earlier ones when it comes to casting women. That said, there’s preliminary evidence that 2015 may have been a correction year. The most successful actress in the industry at the moment, Jennifer Lawrence, publicly called out the film industry — and workplaces in general — for disproportionate compensation and other forms of sexism. And there appears to be momentum in the direction of change. As for what to expect in 2016, I’d wait with much anticipation for August and the release of the 2015 report to see whether last year was really the one when the stagnation started to shift. 4. Maybe we start to get a little skeptical of online ratings. While online reviews have long been a reliable source of information for movie fans, 2015 was the year that the folks who make movies — or rather, the ones who try to sell them to you — started saying that these reviews were directly influencing how movies performed financially. This could be a blame game,2 or it could be a legitimate analysis of the playing field. 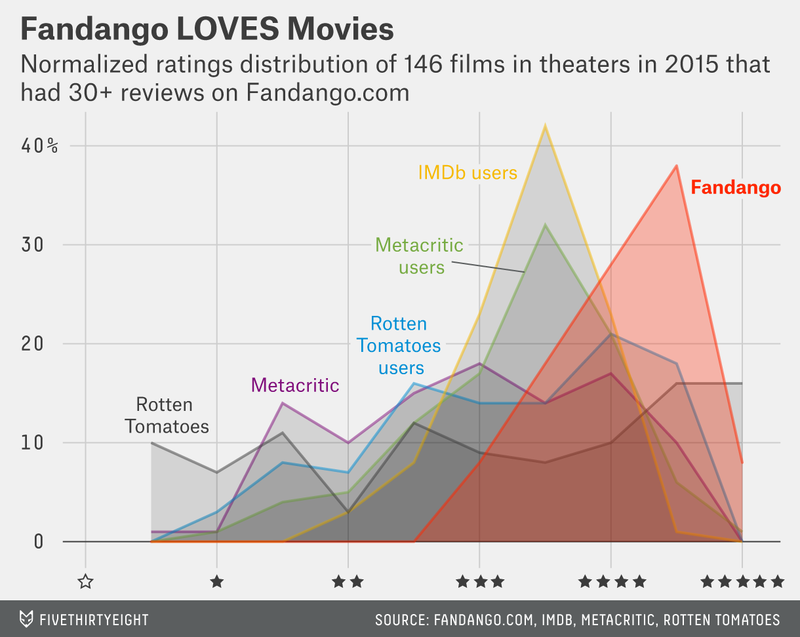 Either way, sites like Rotten Tomatoes and Metacritic appear to be very much on the minds of people who make movies, and there’s a new priority to make sure that films about to open look good online. But your skepticism should extend beyond the algorithmic vote fudging I found on Fandango.com. Although agencies like the Federal Trade Commission are working on ensuring that consumers are protected against false advertising and misleading statements online, the ratings business is still the Wild West. And there’s little sign of that changing next year, so it’s caveat emptor for now: If the monied interests of the industry — who happen to own many of the ratings sites — believe that a good online score is the difference between an “Ant-Man” hit and “Fantastic Four” flop, all I’m saying is it’s not likely the scores are going to get more honest. 5. 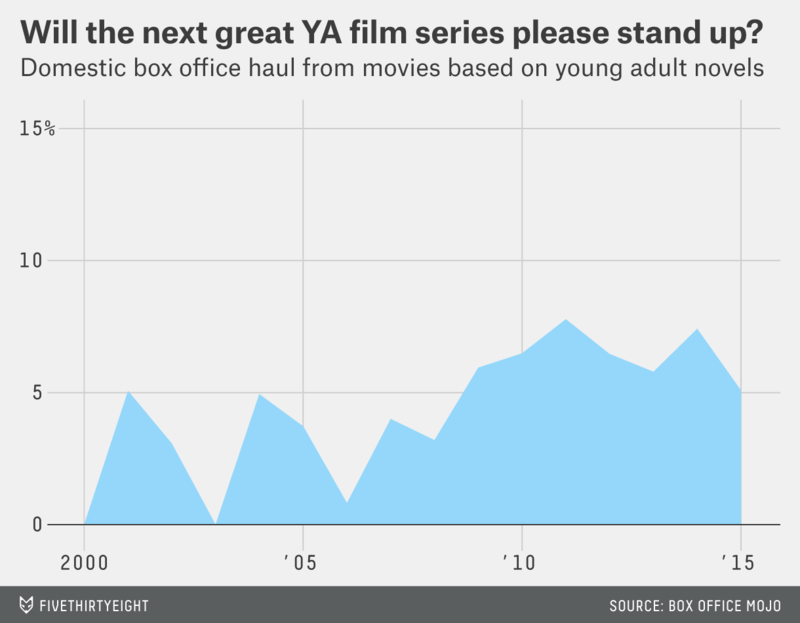 2016 is going to be a dicey year for young adult novel adaptations. See the three years — 2000, 2003, and 2006 — where YA has basically zero share? Those are the only three of the past 15 years in which there wasn’t a Harry Potter, Twilight or Hunger Games movie. So what cavalry is on its way? Box Office Mojo lists three films on the horizon in 2016: newcomer “The 5th Wave”; “The Divergent Series: Allegiant,” the third film in that franchise; and weaponized tearjerker “A Monster Calls.” Based on that list, I’m not expecting the best year for YA-based movies. The genre’s ace in the hole might be “Fantastic Beasts and Where to Find Them,” the first of a prequel trilogy based on a slim book J.K. Rowling published in 2001 and temporally separated from the main Harry Potter story by roughly 70 years. With Academy Award winner Eddie Redmayne starring and Rowling behind the script, the film has a ton of potential. But having just come off of the disappointing Hobbit series — a prequel trilogy based on a slim novel and temporally separated from the main Lord of the Rings story by roughly 70 years — we’ll see. But enough about that. You hear the news about “The Winds of Winter”? In short, the best adaptation of 2016 might be the first third of a series based on a 128-page supplemental book from 2001 — and a spinoff no less. Not a lot of new blood, be it in the metaphorical sense or in the “oh god there is so much blood” sense that Martin’s books typically bring to the table. So far. The new Star Wars movie is still doing its thing. “The movie it was my job to market did really badly and I blame the Internet” sounds like a decent excuse. Which basically invented the genre.